Ngo Van's account of his experiences of May 1968. In May 1968, Ngo Van was working in a Paris factory and soon afterwards he wrote one of the few accounts of what happened by a rank-and-file industrial worker that was published close to the time. His perspective was informed by his previous political experience. He had been a Trotskyist militant in Vietnam in the 1930s and 1940s, imprisoned and tortured both by the French imperialists and Hồ chí Minh's Stalinists. Exiled in Paris in the late 1940s, he soon broke with the French Trotskyists over their dogmatic commitment to formulae such as the ‘deformed workers’ state’. In 1968, his political discussions were focused on a group of workers meeting with the Marxist intellectual Maximilien Rubel, and committed to socialism through the self-activity of the working class. Written by an advocate of rank-and-file workers’ councils, Van’s nuanced account is sensitive to, for example, generational differences in workforce attitudes to les événements and the historical resonances of the conflicting symbols of the bourgeois and proletarian revolutions. An acute historical consciousness informs his observations on the role of the ‘official’ socialists — those of the Communist Party-led union, the CGT, in particular — in ensuring that the student radicals were kept away from the workers. This assisted the trade union leaders in limiting the workers’ political practice to questions of wages and conditions of work. It helped to ensure that, once President de Gaulle had assured himself he had control of the forces of ‘law and order’, a deal for substantial wage increases — initially rejected by the rank-and-file — was sufficient to allow him to restore stability and create conditions for the Gaullists to tighten their grip on political power. Very few Vietnamese socialists who fought both against the French colonialists and against the Stalinists survived to tell their stories. Ngo Van, one who did, wrote of his experiences in Vietnam in Au Pays de la Cloche Fêlée,1 a volume of autobiography that appeared in 2000 and is currently being translated into English.2 In May 1968, Van was working in the Jeumont-Schneider factory in Paris. The second volume of his memoirs, Au Pays d'Héloïse3 — dealing with his life in France — reprints one of the very few accounts published at the time from the viewpoint of a worker in an industrial enterprise of les événements of May-June 1968. Van (1913-2005) was born into a peasant family in a village near Saigon and started work at the age of 14. From 1932 he was active in the revolutionary anti-colonial struggle, and during the 1930s and 1940s he participated as a Trotskyist militant in workers’ and peasants’ demonstrations, strikes and protests — undergoing, as did thousands of others, torture and imprisonment at the hands of the French rulers. The working class in Vietnam was small, but Trotskyist activists were influential in the important industries, and encountered the ruthless hostility not only of the colonial regime but also of the Communist Party of Indochina under the leadership of Hồ chí Minh. Many Trotskyists were assassinated by Hồ's secret police. Those who managed to escape were driven into exile. Living in Paris from 1948, Ngo Van had a succession of factory jobs, interrupted by a stay in a sanatorium recovering from the TB he had contracted in prison in Saigon. Together with Lu sanh Hanh, the most experienced of the Vietnamese Trotskyists to escape Stalinist assassins, he joined the Union Ouvrière Internationale group (UOI), which had recently left the largest French Trotskyist organisation, the Parti Communiste Internationaliste, in opposition to its policy of ‘defence of the USSR’ as a ‘degenerated workers’ state’. After the UOI folded in 1954, Van’s political work centred on an informal discussion group inspired by Maximilien Rubel.4 Most of the participants were industrial workers. In 1968, when Van was at the Jeumont-Schneider factory, where he was to work until he retired, he and others in the Rubel group advocated grassroots workers’ councils, putting themselves at odds with the Communist Party and Social Democratic politicians and official trade union leaders. That night the storm broke in Paris. The cobblestones rained down on the thickheads of the CRS. The barricades appeared in the rue Guy-Lassac in front of the Sorbonne, erected by the students. Sophie [my wife] and I contemplated the uprooted trees in front of the exit from the Saint-Germain metro and on the boulevard Saint-Germain and sensed that something had knocked authority, power, the State, off balance. ‘La chienlit’ screamed the panicky de Gaulle before stealing off secretly — to the French army base occupying West Germany at Baden-Baden — looking to wipe out the student insurgency by military force. At the time I was working at Jeumont-Schneider, the electrical-machine manufacturer. The CGT forbade the workers from uniting with the students to unleash a general strike.6 The union kept the workers ghettoised and chased away students who came to make contact with them. It may seem tiresome, now that everything is ‘normal’, to recall what was no less normal, but in a topsy-turvy way, at the end of last spring. Moreover, what happened here was only one version of what was happening elsewhere, and everyone knows about that. Nevertheless it is not pointless to look into the tarnished mirror of the past in order to try to know oneself. On the afternoon of Friday 17 [May], we whispered in the workshops that the trade unions were cooking something up to cope with the rising tide of unrest. However this was a weekend when nothing happened. And indeed, in the workshops they had practically stopped working, with some showing impatience as they waited for that something to happen. At about nine o’clock the shop stewards went round with a duplicated sheet to be signed: ‘Are you for or against the following demands: minimum wage of 800 francs, 40-hour week without wage reductions, retirement at 60, repeal of the social security regulations, recognition of trade-union rights in the works. Are you for or against a general assembly of the workplace? ’What responsibility are we going to have to take on, we the eternal signers of petitions, demands, requests, all destined for the waste-paper bins? At 10 o’clock the workshops emptied and we gathered in the joinery. There were about 500 of us, mostly workers in blue overalls. The foremen, in grey overalls, were there too this time, and there were a few in white ones. This packing workshop had been, for years, the scene, at one time or another, of routine hour-long or half-hour meetings of workers who had stopped work at the call of their unions, meetings never attended by so many as were to be seen there on this morning of Monday, May 20. But routine had not ceased to rule — the same people managed the game and the rest played it. The shop stewards were on the platform and the crowd, as ever, was almost silent. The first to speak was a CFDT shop steward, a turner, a middle-aged fellow with deep, shining eyes and a determined, passionate air. He praised the students’ courage and said that it was time for the workers to enter the struggle ‘to open the eyes of the employers and the government who have for ages refused to negotiate with the unions’. Shyly, a small red flag was unfurled and then raised behind the group of speakers. ‘I am not a Communist,’ he said, ‘but I am for the red flag.’ Then he recalled how the emblem had originated: during the barricades of 1848 someone had picked up a shirt steeped in the workers’ blood. This had served as a flag, and the shirt was said to be still preserved in a museum in Moscow. This was a bit startling, even so. Collections for the striking coal-miners or for Vietnam had been conducted with the tricolour. It was spread out at the factory exit and everyone showed his ‘active solidarity’ by casting his contribution into this sacred rag of the fatherland. Yes, indeed! We should look silly, before those students on the barricades, with their red flags and black flags, if we had brought merely the blue-white-red flag. After the CFDT shop steward, the one from the CGT confessed that he hadn’t much more to say, and proposed, as the way to support the unions’ demands, an indefinite strike with a sit-in. The young workers seemed keen for action, the older ones seemed worried. The decision was taken by ballot. Everyone wrote his yes or no on a little piece of paper. The result was two-thirds for the strike, one-third against: about a score for a strike without a sit-in. ‘We call on you,’ said the CGT shop steward, ‘to put away your tools and leave the benches clean.’ We sensed the authority of the ‘official’. And so the everyday routine was broken, and everyone, shaken, was more or less dragged out of his apathy. The problem was there, and each saw it in his own way. After the midday meal we gathered in the canteen and elected a strike committee. Most of the candidates who were put forward to be approved by the meeting were shop stewards or other members of the CGT and CFDT, but a few ‘unorganised’ youngsters were allowed in. A strike picket of 40 men, all volunteers for the task, would ensure that the factory stayed occupied, day and night. The committee invited everyone to come every day to take part in the sit-in. Actually, this was just to protect the access to the factory — since only the strike picket was allowed in the workshops. ‘And why should we occupy the factory? So that the boss doesn’t lock us out. Once before he played that dirty trick on us, and then, one by one, summoned the workers he was willing to take on again.’ The young members of the committee were given the job of ‘organising leisure activities’, so as to stop the occupiers getting bored — a boredom, we foresaw, that could be as unlimited as the strike itself. In the first week many of us came to the factory, and meetings organised by the strike committee for information and discussion took place frequently. After Grenelle9 the CGT and CFDT showed a lack of enthusiasm for meetings of the strike committee and mass meetings of the strikers, using the inter-union meetings that were held nearly every day as the excuse for calling them as infrequently as possible. Or else they briskly hurried through the meetings of the strike committee, talking only about the canteen, or the night-time guard, and that was all. On Wednesday 21st, the young workers suggested that discussion groups be formed, to consider our demands and other problems.10 After the meeting about 30 workers gathered in the conference room (which in normal times was open only to the managerial staff), because they were keen on this idea. A very good discussion developed about our demands, their contradictions and inadequacies. They got on to the question of the relation between trade unions and political parties, but the discussion came to a sudden end when the CGT shop stewards intervened, speaking forcefully and interrupting everyone. On the first day of the strike the red flag flew alone over the factory gate, which was sealed with a big red poster of our demands. From the next day, however, the tricolour was there, side by side with the red flag. We were to understand later what this signified, when the Communist Party proclaimed itself a party of order, ‘the first to denounce the sects of extremists and provocateurs’ and declared that it had been able to unite ‘the flag of the French Republic’ with ‘the flag of the working class’. Monsieur Waldeck Rochet was going too far.11 The flag of the Communards is not to be mixed up with the flag of Versailles. The tricolour is the flag of today’s bourgeoisie and bourgeois state. It is under these colours that, since 1789, the bourgeoisie has exploited the workers and sent them to die on the field of honour; under these colours it has enslaved the black and yellow peoples. At the meetings the workers had little to say, expressing themselves with difficulty. I record, at random, the things that I recall. Somebody proposed, one day, that we discuss the demands we had formulated, reminding us that, in 1936, we had won the 40-hour week and had since then had always worked between 48 and 56 hours — and now, 32 years later, we were back at the same point. ‘In these 32 years technology has evolved and production developed,’ said an old worker. ‘Why demand 40 hours and not 35?’ And if, tomorrow, the employer and the government were to agree to 40 hours, what would prevent them from conning us just as before? Retirement at 60 would allow the old workers to enjoy some rest and the young to find work. The proposal did not arouse much interest among those present and the committee closed a debate that had not even begun. Some comrades spoke of unity in struggle between the university and the factory and proposed that we invite the Unef students of the 22 March movement to come to our factory and tell us about their action.13 When the strike committee rejected this, they asked for their proposal to be put to the vote: this was noted without reply. Although a certain number of comrades favoured the idea, nobody insisted. The shop stewards and young members of the CFDT, who were in favour of such an association between workers and students, did not want to oppose the CGT shop stewards, for fear of ‘breaking unity of action’. A group of young workers went to the ‘communist’ Town Hall of Saint-Denis in order to obtain a venue, away from the factory, where they would be able to discuss with the students. At first they met with refusal, on the pretext that there were some suspicious elements in the Jeumont-Schneider factory. But then, to satisfy these young workers, a CGT shop steward intervened and they were given a room at 120 Avenue Wilson, about a 100 metres from the factory. However, the intended meeting did not take place, as the Unef students did not turn up. It was the day of the demonstration at Saint-Lazare railway station, organised by the CGT in favour of a democratic government with communist participation. At the general meeting the strike committee, or rather the GCT shop stewards, invited those present to take part in this demonstration in order to ‘support the negotiations between the bosses and the metalworkers’ union.’ ‘Now you are trying to politicise the strike,’ somebody said. ‘What are you up to? The demonstration is intended to give backing to your policy, Séguy said so last night on the television, and you are trying to make us believe it’s only to support our demands.’ For her part, the woman shop steward for CFDT proposed support for a possible government headed by Mendès-France. Little by little, people began to speak out, especially outside the mass meetings, on the night-time pickets. As a workmate put it: ‘This strike will have got the workers talking at least.’ We discussed the events, the students, fascism especially. Some went in the evening to the Sorbonne, the Odéon or the Ecole des beaux-arts, and when they came back next day they brought ideas and the free atmosphere of those places. Very often, faced with the fiasco of the economic demands presented at Grenelle, the idea of workers’ self-management was brought up. The workers were not hostile to the idea but doubted their ability to put it into practice satisfactorily. They felt that this was a global problem, to be tackled in a much wider context than the individual factory, or even France as a whole. We sensed, too, that the trade unions were not in favour of ending the existing social order. The entertainments committee invited some Portuguese performers to come and sing fados. When they arrived, on Wednesday 21st,14 at the gate of the factory, our Portuguese friends compared the breadth and depth of the movement with the paltry content of our demands, and this aroused the distrust of one of the CGT’s women shop stewards. Our friend concluded by saying that we must not let ourselves be cheated. This produced a violent reaction from the CGT woman shop steward: ‘You are here to sing, so sing! The workers are our concern.’ The dialogue continued nevertheless, but, soon, our friends were asked to leave the factory, supervised by the guard on duty, and we ended the afternoon with them in a cafe´, away from the trade union representatives. Apart from these incidents, trade union order did indeed prevail in the factory. The tools were left intact; there was no smashing of machines by the students. No conflict, no hostile behaviour of any sort by the young zealots or the ‘anarchistic’ older men. The manager was there every day, in his office. He signed for the release of funds for the canteen, arranged advances of wages for the strikers, now and then had talks with the shop stewards, took no decision on his own. He, like us, was waiting and following instructions . . .
Then something important happened: the engineers came out on strike. On the first day, they held their meetings separately. Four days went by before, by a small majority, they decided on a solidarity strike. They held out for three weeks, meeting every day to discuss and work out their own statement of demands. Then they called for a secret ballot of the entire workforce, for or against going back to work. The majority of the strikers opposed having such a vote, and the engineers went back to work. As the factory was closed and guarded by the strike picket, the engineers worked on sites outside it. In the middle of the last week of the strike, the big boss agreed to talk with the shop stewards. Events speeded up. On Thursday, 13 June, at the mass meeting, the CGT shop steward said that we must resolve the question as to whether to go back to work and, for his part, he proposed a secret ballot on this question. On Friday 14 [June], as anticipated, we went straight to a vote. The polling booths were brought out, just as for the routine elections when we had to choose the factory committee or other representatives of the workforce. The majority of the workers were discouraged and thought that one week more or less would make no difference, now that the other branches of industry were already back at work, that the workers’ front had been broken and the metalworkers were almost alone in continuing to fight. The canteen was full when the result was announced: 423 votes for going back to work, 135 for continuing the strike, three spoiled ballots. The meeting erupted. Those who wanted to ‘go on with the fight’ were pleased, however, to find that they were so numerous. The management and the shop stewards hurried to bring the affair to a close. They proposed that work be resumed that same afternoon, and the management would generously pay wages for the whole day. On every side the workers called out: ‘Monday, Monday!’ A clear majority seemed to reject the bargain offered. At 1pm, what a surprise! The entire leadership of the CGT and the CFDT was at the factory gates, which were wide open. Two shop stewards carrying the flags, the red one and the tricolour, made their way into the factory, followed hesitantly by a minority of the workers… When they were inside they sang the Internationale. Monday morning, everyone was at work as usual: ‘normality was restored’. P.S. On Wednesday 22 [May], two days into our strike, the trade unions announced their readiness to negotiate with the employers and the government. At the news of the opening of talks with Pompidou, everyone thought that, given the paralysis the country was in, and the permanent insurrectionary agitation by the students, which had spread to the working class, there was a good chance that the bosses and the capitalist state would give up something substantial. The hopes of some went further still: the bosses would surrender quickly, and we would probably be back at work the following week. However, as soon as the famous agreement of Sunday 26 [May] had been announced, and Séguy and Co. had been booed at the Renault works, everyone felt that they had been conned, and realised that the struggle would get harder. At the mass meeting on Tuesday, after telling the strikers the terms of the agreement, the shop stewards themselves, as though gripped by the general unease, simply proposed a continuation of the strike. The feeling that we had been swindled was strengthened when the government split the movement by granting advantageous conditions to certain key sectors (electricity, the metro, the railways, the postal service…) and the trade unions celebrated this as their victory. 1. Ngo Van, Au Pays de la Cloche Fêlée (Montreuil: L'Insomniaque, 2000). 3. Ngo Van, Au Pays d'Héloïse (Paris: L'Insomniaque, 2005). 4. Maximilien Rubel (1905-1996). Marxist historian and prolific author; born Chernivisti, Ukraine; educated there, in Vienna and at the Sorbonne in Paris. Became a French citizen in 1937; fought in World War II, then lived, secretly because of his Jewish origins, in occupied Paris. Participated in the Resistance, and was concerned at the misunderstanding of Marx prevalent amongst Communist Party members he encountered. Preferred the term ‘Marxologie’ which he distinguished from ‘Marxism’. Argued that the ‘self-movement of the working class’ was a critical concept if Marx’s work was to be developed against official doctrines. See Ngo Van, Une Amité, une Lutte, 1954-1996 (Paris: L’Insomniaque, 1997). 6. Confédération Générale du Travail, the leftist union centre linked to the Parti Communiste Français (PCF). Coordinated activities with the CFDT (see below) after 1966. 7. Confédération Française Démocratique du Travail. One of five French trade union organisational centres. Created in 1964 when the majority of the Confédération Française des Travailleurs Chrétiens voted to be a secular body — close to the Parti Socialist Unifié (PSU), led by Pierre Mendès-France. Mendès-France (1907-1982), a lawyer, had been a member of the Radical Socialist Party (not the mainstream social democrats). He served with the Free French but resigned from de Gaulle's post-Liberation government over its free-market policies. Was later twice prime minister, negotiating the French surrender in Vietnam. Opposed de Gaulle's seizure of power in 1958 and joined the PSU. Unusually for French politicians of his age and status, he sympathised with the students in 1968. 8. When Blum’s Popular Front government was elected in May-June 1936, a general strike was in progress. The PCF argued that it was not a revolutionary situation and assisted in the negotiation of the 40-hour week and wage increases to assist Blum in bringing the action to an end (the Matignon Agreements of 7 June 1936). On 11 June, PCF leader Maurice Thorez famously declared, ‘It is necessary to know how to end a strike.’ Strike action was over by the summer and when, in the autumn, workers returned from the paid holidays they had gained, they found their wage increases eaten away by inflation. In February 1937, Blum responded to the flight of capital from the French economy by declaring a suspension of the reforms gained the previous year. 9. The Accords de Grenelle were negotiated at the Ministry of Social Affairs in the rue de Grenelle between May 25 and 27 by Local Affairs Minister Jacques Chirac, on behalf of the Pompidou government, Georges Séguy of the CGT for the trade unions, and the bosses’ organisation. In the medium term, the agreement led to substantial increases in the minimum wage and in average real pay, but at the time it was rejected by the rank-and-file, and there was a huge demonstration in the Champs-Elyse´es on 29 May. Next day, President Charles de Gaulle returned to Paris from secret meetings at Baden-Baden, dissolved the National Assembly and called elections for the end of June, in which the Gaullist party won an overwhelming victory. 10. ‘Le mercredi 21’ in the original. 21 May 1968 was in fact a Tuesday. 11. Waldeck Rochet (1905-1983) was General Secretary of the PCF. Named after the 19th-century Republican leader René Waldeck-Rousseau. Joined the PCF youth movement in 1923. Attended the International Lenin School. Party secretary in Lyon, 1936-1940. Served as a parliamentary deputy. Arrested in Algeria in 1940 and held by Vichy authorities until freed by the Allied advance. Fought with the Free French and represented the PCF in London till returning to Paris after the Liberation. Third in the party hierarchy after Thorez and Duclos before becoming General Secretary from 1964 to 1968. 12. Georges Séguy, born 1927. General Secretary of the CGT, 1967-1982. Railway workers’ union executive member in Toulouse, 1946-1949. General Secretary of the national railway workers’ union, 1961-1965. Partisan fighter during World War II, arrested in 1944 and sent to Mauthausen camp. Member of the Political Bureau of the PCF, 1960-1970. 13. Unef 22 March movement. 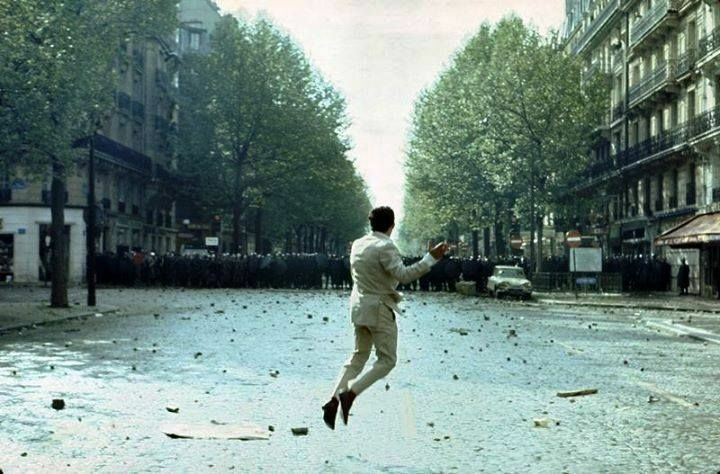 Student movement born on 22 March 1968 at Nanterre, led by Daniel Cohn-Bendit and Alain Geismar. Organised a prolonged occupation of the university. I didn't forget to mention anything - since I didn't write any of it. The entire text (including the brief biography of Ngo Van at the beginning) comes from an old issue of 'Critique' journal. The ICO and E&M are, however, both mentioned on the accompanying Faceboo,k post. "After the UOI folded in 1954, Van’s political work centred on an informal discussion group inspired by Maximilien Rubel.4 Most of the participants were industrial workers. In 1968, when Van was at the Jeumont-Schneider factory, where he was to work until he retired, he and others in the Rubel group advocated grassroots workers’ councils, putting themselves at odds with the Communist Party and Social Democratic politicians and official trade union leaders." It is thiese lines which are incomplete and somewhat inacurate. The participanrs to the Rubel groupe publishing les "Cahiers du socialisme de conseils" were not industrial workers:most of them were intellectuals. All the workers of this group were members of the workers group ICO; Van was in 1958 a worker at the Morse facrtory which after several merging became Jeumont- Schndeider . He was then a member of a factory workers group in opposition to the main unions and publishng a factory paper "Tribune Ouvrière Morse"